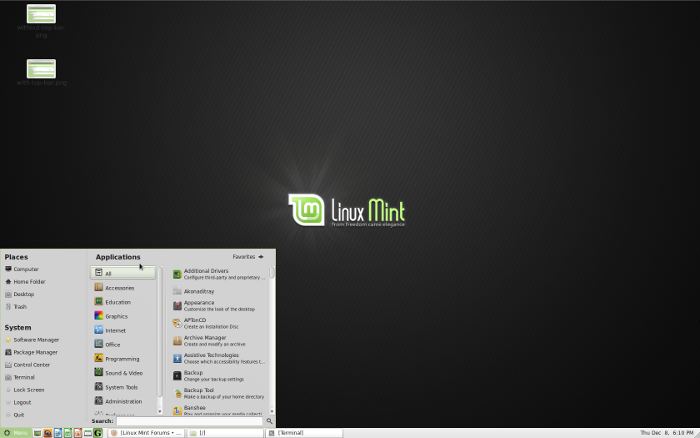 French version with additional tweaks at www.linuxmint-fr.org - maintained by Major Grubert. 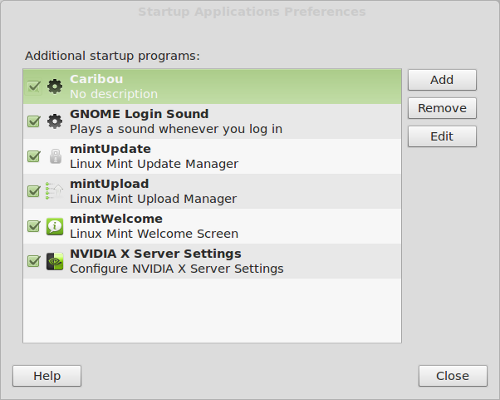 Please note: these tips are for - and tested in - MGSE, the default Linux Mint 12 login session, the one that looks like this. Use them in other distros, other desktop environments and other login sessions at your own risk. I don't think many of of these are of much use to MATE or Gnome Classic users. Unless otherwise noted all tips have been tested on my machine but I cannot guarantee that they work for you as well as they did for me. If you're not comfortable running terminal commands, ask in the thread if there is another way of applying the fix. z. Don't like Mint 12? 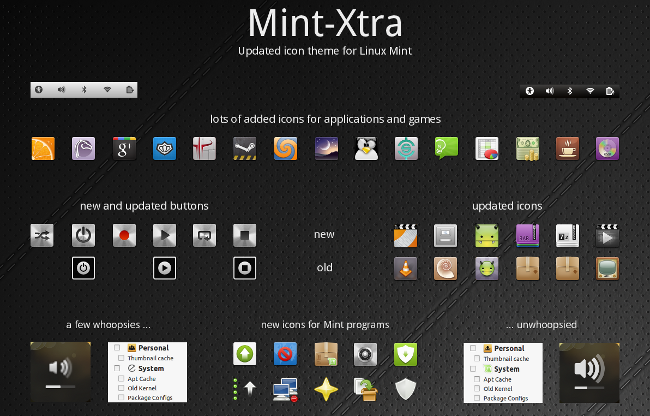 - NB: as the Mint themes and extensions are in the Mint PPA, they will be updated occasionally and whatever changes you make to the theme/extension system files will be overwritten each time. 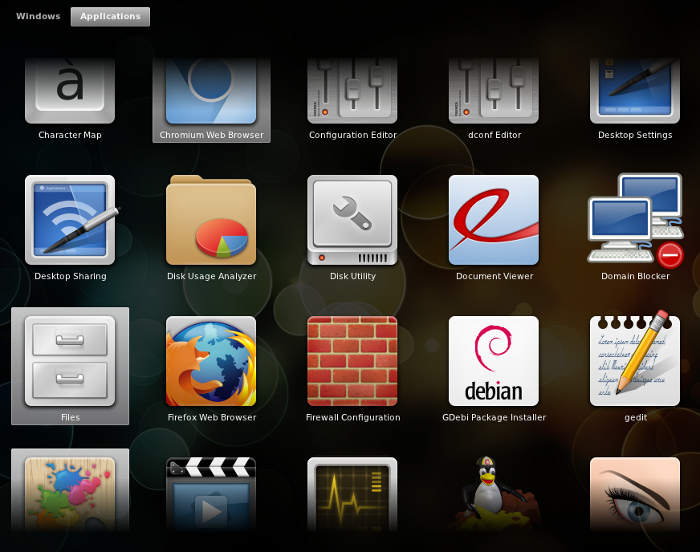 A way around this is to copy the theme/extension folders and use the copies for your fixes. That way you won't get updates for themes and extensions, but you won't lose your tweaks either. You can also just apply your tweaks after each update, doesn't take too long once you get the hang of it. ... and change "NoDisplay=true" to "NoDisplay=false" manually. gconftool-2 -s -t string /desktop/gnome/shell/windows/button_layout "close,maximize,minimize:"
gconftool-2 -s -t string /desktop/gnome/shell/windows/button_layout ":close"
Reload the shell to see the changes (press ALT+F2, press r, press enter). Will take effect after next restart/shutdown. 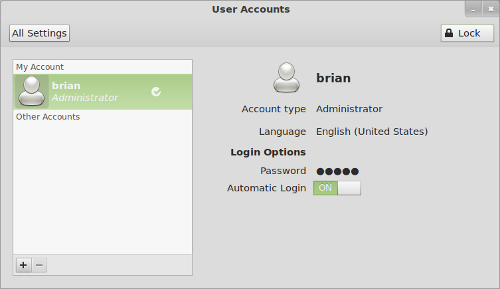 Open System Settings and find "User Accounts" - unlock in top right corner and turn automatic login on. And untick away. In my case deleting all "Debian" subfolders did the trick. You must uncheck from the lowest level up, so expand all folders and uncheck upwards. As an alternate method, some users have had more luck simply uninstalling the "menu-xdg" package. Consider trying that if you can't get the above to work. 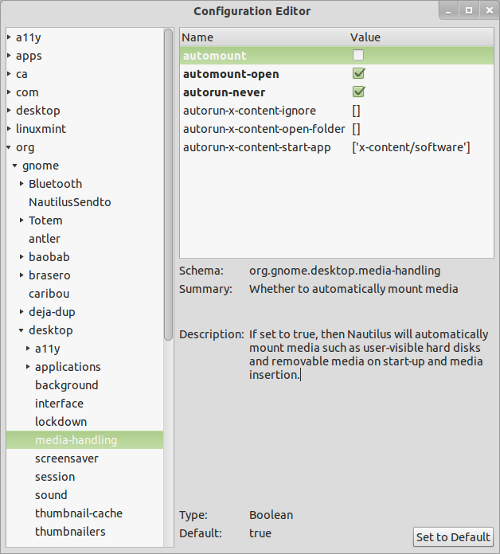 Using alacarte (see previous fix), easily hide the out of place MATE icons (the red car with open hood "Configuration editor", "Sound Recorder" and "Volume Control") from all your Gnome Shell menus by unticking them in the categories "System Tools" and "Sound & Video" - don't untick the proper square icon "Sound Recorder" supposed to be visible in Gnome Shell. You can also do this manually by navigating to ~/.local/share/applications/ and delete the "mate"-prefixed .desktop files. Tried it on my system and no collateral damage so far, should be safe enough. By default, when you insert a USB or an external harddisk, nautilus opens a window AND a system notification pops up asking you if you want nautilus to open a window. Find "Removable media" in the "System Settings" menu, check "Never prompt or start programs on media insertion". 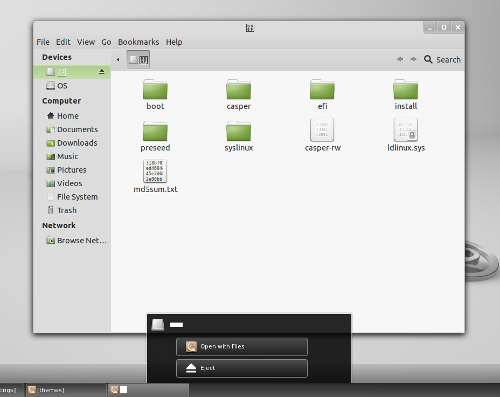 A neat little extension that adds a removable drives icon to the top panel when you insert one, from there you can then choose to open a nautilus window or eject. 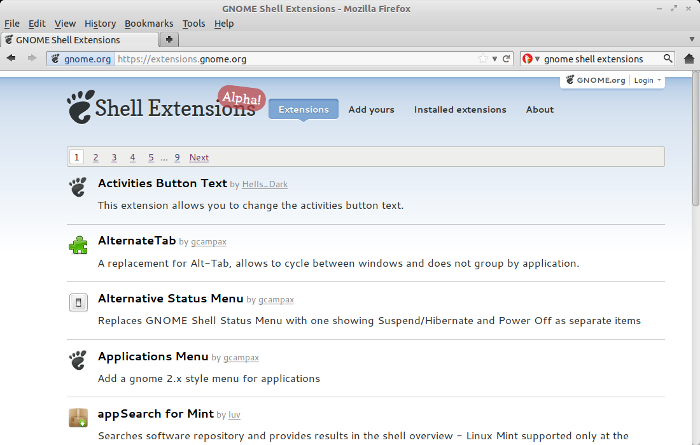 Get it at the Gnome extensions website (remember the site only works with Firefox). You can change screen brightness in the Screen settings dialog, but it won't be persistent, you must repeat it every time your boot up your laptop. This has bugged many users so thanks to esteban for pointing to a relatively easy fix. 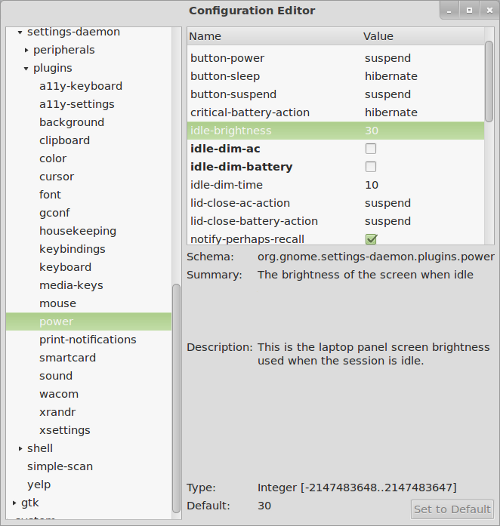 gsettings set org.gnome.settings-daemon.peripherals.input-devices hotplug-command "/home/USERNAME/.lowerbrightness.sh"
And that's it, persistent brightness setting. 1z. Don't like Mint 12? 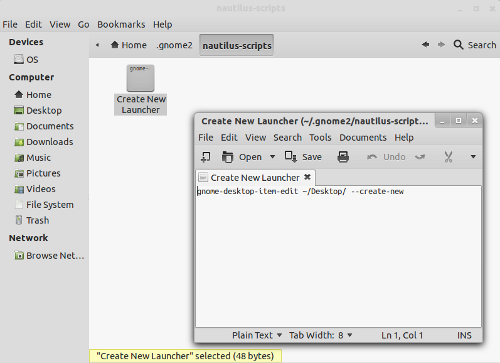 If the new Gnome 3 desktop environment frustrates you, consider logging into MATE. MATE is a Gnome 2 fork and works and looks like the old Gnome 2 desktop, albeit with a few hiccups that haven't been ironed out yet, but it's getting there. Change login session by clicking the cog wheel next to your username from the login screen. The long-awaited GNOME Shell Extensions website is now up and running. 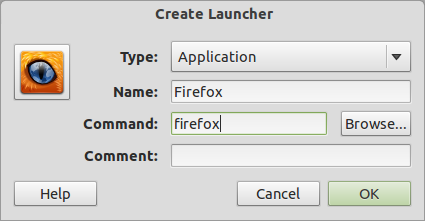 This will be the place from which you customize and enhance you shell setup, in a way similar to how Firefox addons work for Firefox. The site is in alpha and so far only works with Firefox. I've tested a few extensions and the installation process works perfectly (no progress bars to indicate installation process, though), just remember to reload the shell (press ALT+F2, press r, press enter) every time you install an extension. 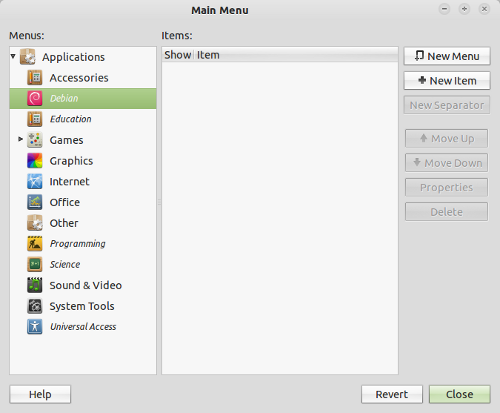 This was a thoroughly brilliant idea - install software from Mint's repositories via the overview search/filter box. If you want to install e.g. Skype, simply press the Windows key, type "skype" and press enter, then you're installing it. 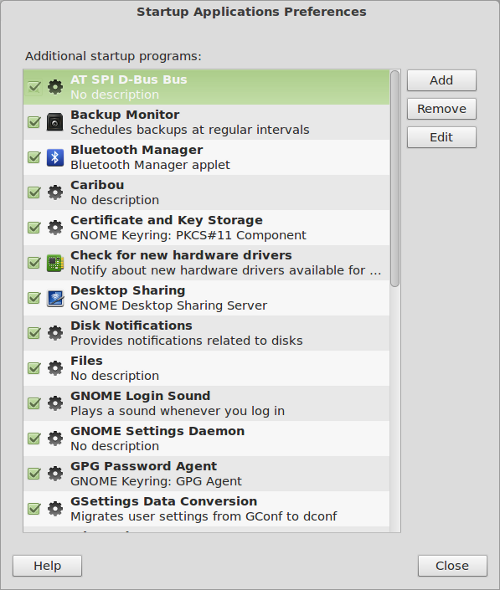 It even makes CTRL+ALT+T + "sudo apt-get install skype" seem cumbersome, and yet it's all GUI. 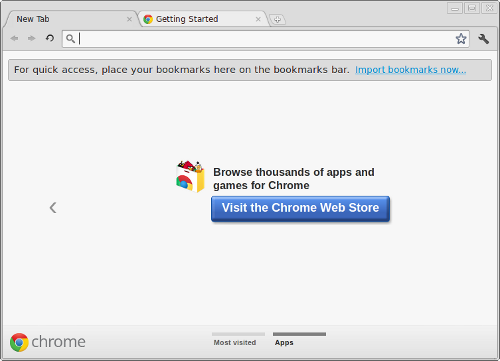 Dash, the vertical left favourites bar in the overview, disappears with this extension activated. It's a little weird at first but after a while you've forgotten about the favourites bar and don't want it back - creates more space for windows and apps. Or quicklists as they're called in Unity - this makes the above mentioned favourites bar much more useful if you don't want to remove it. A must if you never connect to bluetooth devices - removes the bluetooth icon from the panel. The little focused window button at top left next to the overview button is useless if you use the MGSE bottom panel, and, well, also useless if you don't. 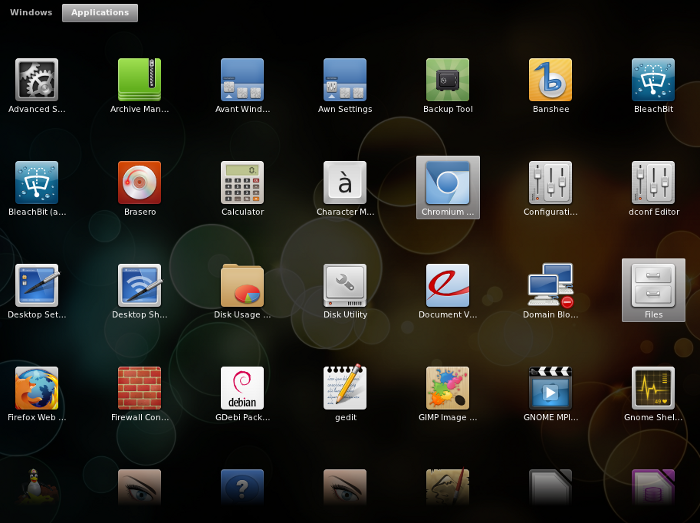 Self-explanatory, toogles top panel autohide mode on and off by simply double clicking on the panel. Find your city on weather.com - on the city page, copy the last 8 letters of the url in the address bar (e.g. DAXX0009 for Copenhagen, Denmark), paste it into the WOEID field in the extension's preferences and press enter (the code for Innsbruck, Austria is there by default, so you can skip this step if that's where you live!). 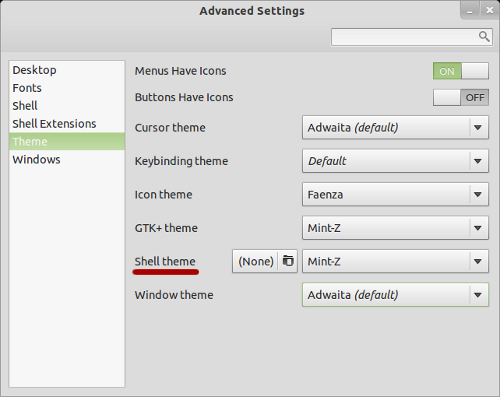 Simply turn off the bottom panel extension with Advanced Settings under "Shell extensions". This moves Mint menu and the minimized window tabs up in the top panel, if you also want those gone, turn off the menu extension and the window list extension as well. 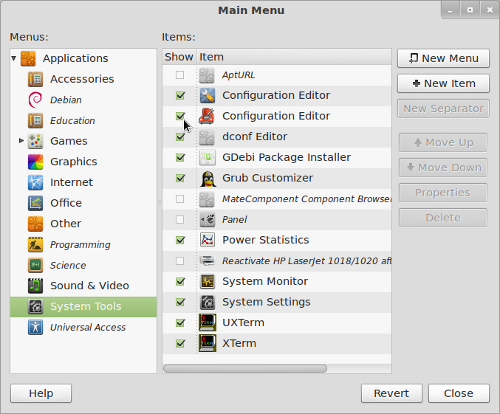 To replace the infinity symbol logo with gnome shell default "Activities" text, find the section below in the file and put "//" in front of the lines as shown. 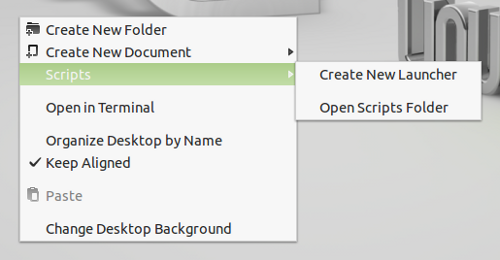 To replace with a different image, simply rename the current "start1.png" and "start2.png" in the /usr/share/themes/Mint-Z/gnome-shell/ folder to e.g. oldstart1.png and oldstart2.png and replace with your own images titled start1.png and start2.png (it can be the same image as both, start2.png is displayed on mouse-over and start1.png is displayed on mouse-not-over). Because this has a bug where it moves window captions in the overview half into the window title bars for the infinitesimal benefit of showing windows slighly more accurately where they are placed on the desktop in the overview, consider turning it off. 16px is of course just an example, you can choose whatever suits you. ... and change "height" to 0px like I have done. Reload the shell (press Alt+F2, press r, press enter) - no more bottom notifications bar. NB! This worked smoothly for me but if you're experiencing the same as lurkatron, try to change to 1px instead of 0px. I.e. auto-maximize when you drag windows to the top of the screen and window snapping when you drag to left and right edge. 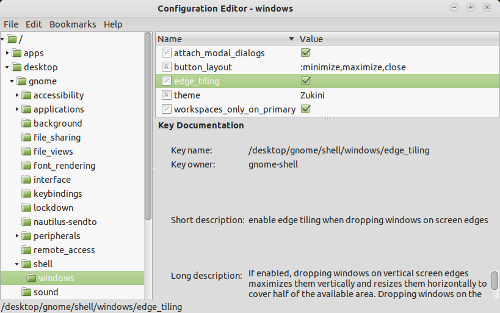 Launch "Configuration Editor" (gconf-editor), navigate to desktop/gnome/shell/windows and uncheck "edge_tiling"
Reload the shell (press Alt+F2, press r, press enter) to update the change. ... comment out the three lines with two forward slashes like I have done. Reload the shell (press Alt+F2, press r, press enter), clock in middle. dalcde has not disabled the MGSE specific extensions in the screenshot above - I think that's worth doing to avoid unnecessary duplication and to keep the shell from running more activated extensions than it has to, if you're gonna try this out. 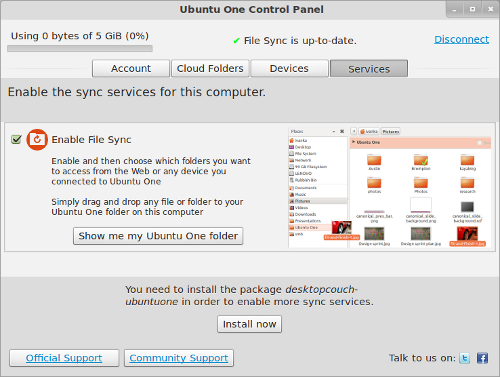 That's it, launch Ubuntu One and log in. 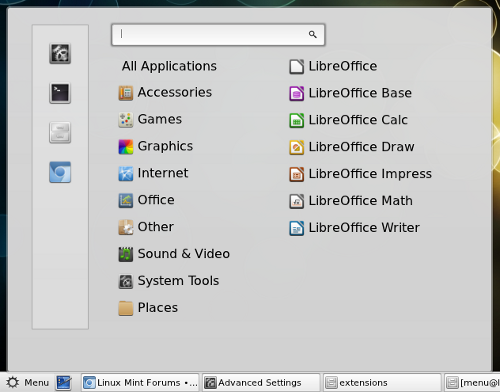 There was a time when Mint's Software Manager could look down on Ubuntu's Software Center - with the revamped USC 5, tables have turned and Software Manager now feels like a truncated and outdated version of the big brother counterpart (despite being definitely on the sluggish side) with options to e.g. easily view installed or installable packages by PPA among other basic functionality currently missing in Software Manager. Installing it does pull 50mb of dependencies, though. 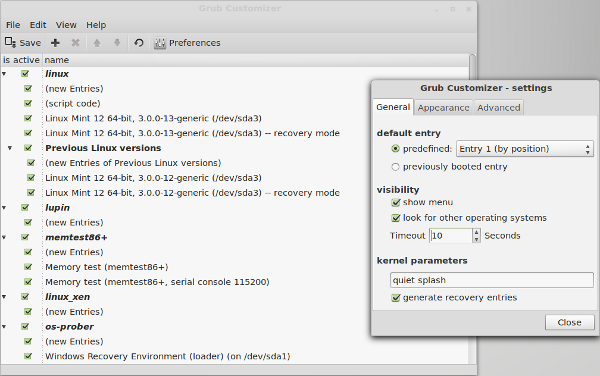 With it you can easily choose which entries you want to appear in the grub menu, rename them, set timeout, set default boot, set kernel parameters, change text and background colour and more. 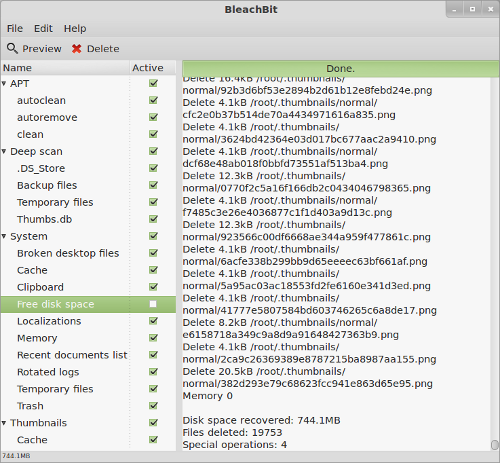 Bleachbit is like CCleaner for Windows and quickly trims off your system's love handles. I lost 744mb on a one day old install - help .pdf files in Serbian, application cache, thumbnails etc., it adds up (Warning! Make sure "free disk space" is unchecked because, unlike the other ones where bleachbit warns you they take a long time, wiping free disk space actually does take a very, very long time). The cleaning shown in the window below took less than 30 seconds. Worked brilliantly for me despite some terminal error messages on installation - no more CPUs suddenly for no apparent reason going into overdrive - not guaranteed to work for everyone, but worth trying if you have similar issues. 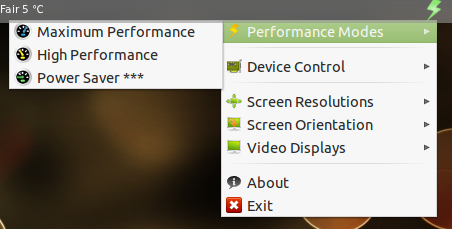 If you're using "Power Saver" mode by default, remember to change setting to at least "High Performance" before watching videos of playing graphics heavy games. Finally the new version is out. 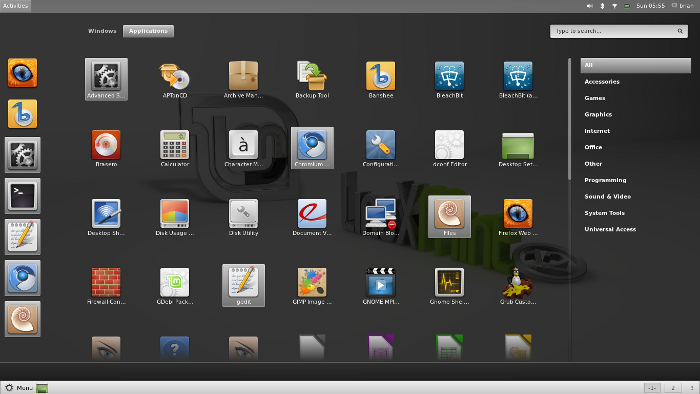 It has a revamped interface and a few less tweaks than in previous versions (tweaking Gnome 2) but is still as useful as ever. 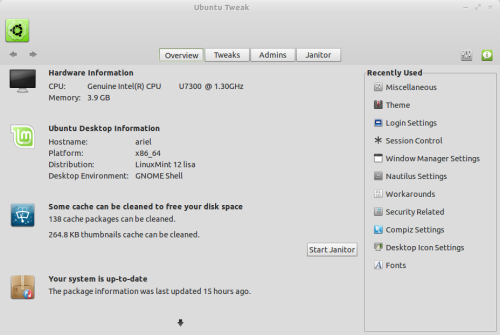 Ubuntu Tweak 0.6 is of course designed for Ubuntu 11.10 and a few tweaks like "Compiz Settings" and user menu settings under "Session Control" won't work in Mint 12, but most of the tweaks work in Mint 12 as well. Reload the shell for theme to be fully in place (press Alt+F2, press r, press enter). Some themes come with an installation script and a few you can install via PPA but most themes you'll have to install like this. 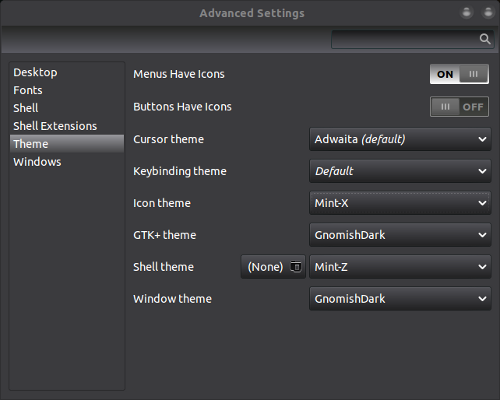 NB: Your themes must be compatible with your current shell version. 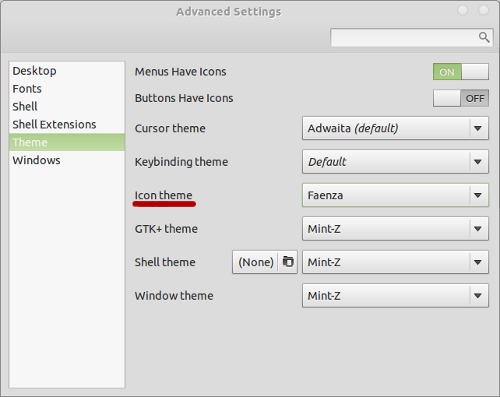 Most available Gnome 3 window themes are made for version 3.0, not 3.2, and they won't work properly in Gnome 3.2 (current version in Mint 12). 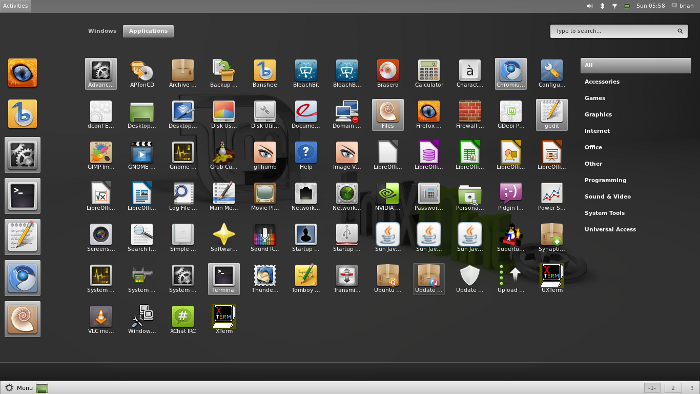 Most of the popular icon themes for linux come with either installation scripts or have a dedicated repository you can add. The icon themes that don't come with installation scripts or PPAs you install the same way you install window themes (see 4a above), except the downloaded icon folder must be moved to "/usr/share/icons/" instead of "/usr/share/themes". Whatever image you choose, make sure the "Others Access" under the Permissions tab in the chosen image file right click menu is set to "read-only" and not to "none". Last edited by bimsebasse on Tue Feb 21, 2012 10:43 am, edited 88 times in total. Re: Mint 12 Tips & Tricks Guide ... Thread! very informative posts. thanks. Just posting from Mint 12 Live DVD. Thank you very much for this. Priceless! Excellent post bimsebasse. My only comment is about advising the direct customization of the theme in /usr/share as changes are likely to be overwritten if there is any update to those files. Surely it would be better to make a copy of the entire theme, customize that then select the copy, leaving the original untouched? It would still mean re-doing changes if there 'was' an update, but at least the changes wouldn't be lost. [Edit] your original post and add [SOLVED] once your question is resolved. “The people are my God” stressing the factor determining man’s destiny lies within man not in anything outside man, and thereby defining man as the dominator and remoulder of the world. 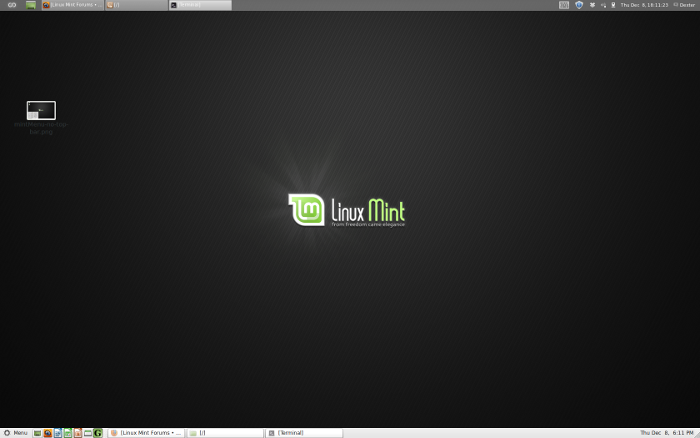 I do not see the attachment for the Mint Logo corner ripple. Where is that? Everything else is awesome! Edit: Nevermind. I blew right past it. Got it now. How do you get the weather extension to save your city? Mine keeps reverting back to the stock setting. 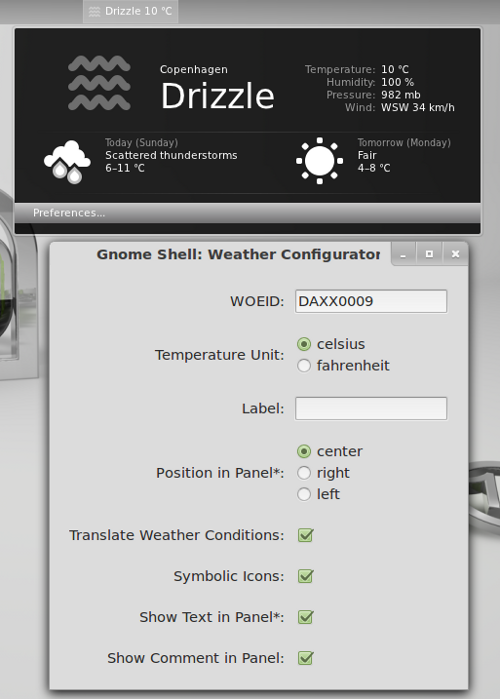 z06gal wrote: How do you get the weather extension to save your city? Mine keeps reverting back to the stock setting. Very nice. Need to keep this thread open. I will be sending the unhappy Ubuntu users this direction. Better include this in the description, thanks for bringing it up. remoulder wrote: My only comment is about advising the direct customization of the theme in /usr/share as changes are likely to be overwritten if there is any update to those files. Surely it would be better to make a copy of the entire theme, customize that then select the copy, leaving the original untouched? It would still mean re-doing changes if there 'was' an update, but at least the changes wouldn't be lost. You're right of course, will do. 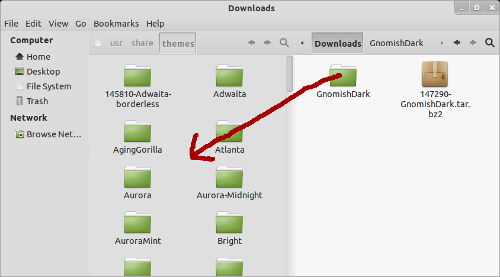 There is an extension for that called GNOME Shell noa11y, which removes the Accessibility icon from the GNOME Shell system status area. Wayne, thank you so much! Got it! I think that's turned on by default? bimsebasse wrote: I think that's turned on by default? I think you are right. I think I recall now turning it off because I thought it was interfering with another extension I installed. These are excellent tips for tweaking! Thanks!